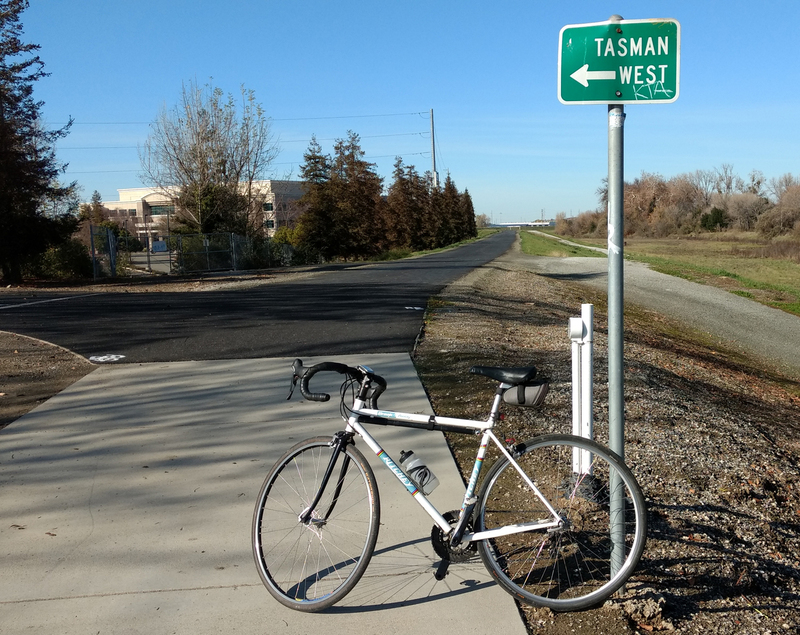 Newly paved section of Coyote Creek Trail looking north from Tasman Drive in San Jose. Slowly but surely, Coyote Creek Trail is being paved from bay to Morgan Hill, including the latest segment between Hwy 237 and Tasman Drive in San Jose. That’s about a mile. The heavy lifting will occur between Kelley Park and Montague Expressway where there are many obstacles in the way. Of course, that section isn’t even open. The newly paved section was open and gravel. I’m seeing a lot more homeless people in places I never saw them before, like along the paved trail on the north side of Hwy 237. Yes they cleaned out the Coyote Creek camps, but those same people had to go somewhere, so now they’re along Guadalupe River and other parts of Coyote Creek. This entry was posted on December 27, 2016 at 9:53 pm and is filed under Ride reports. You can follow any responses to this entry through the RSS 2.0 feed. You can leave a response, or trackback from your own site.